At Dent-ALL By Dr. Z, patients can also have a variety of cosmetic dental work and cosmetic dentures. One of the most popular cosmetic procedures today is teeth whitening. 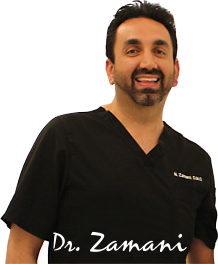 Dr. Zamani offers his patients three different teeth whitening techniques at his office in Sherman Oaks, CA. 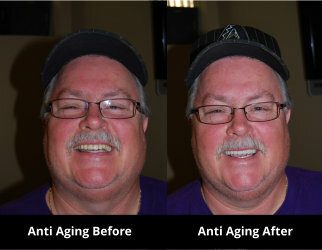 A patient can choose one of the two best at home teeth whitening kits. The first is a whitening kit used at home for two hours a day for ten to fourteen days. The second at home whitening kit is called the weekender. It allows the patient to whiten his/her teeth at home in three nights. Both of the above kits require trays to be made by simply taking impressions of the mouth. Currently, the most popular and the most effective technique used, is a 1-hour in-office whitening procedure. This is a little over an hour procedure, which by using a special light over the teeth, gives the patients the convenience of instant whitening, therefore leaving the dental office with the maximum whitening results possible.